So I'm having an interesting issue after installing and configuring my authentic BLTOUCH Smart V2 with my FT-5 R2. I currently am using a titan aero/ E3D V6 hotend/extruder, TMC2208 Drivers, Original MKS Board, 713 ultra lite x carriage, 713 Maker all metal gantry, Plus a couple more things (but those should be the important ones. My BLTOUCH is Mounted to the left of my hotend, and connected to my Z_MIN PIN. The issue Im having is related to bed leveling. Im able to Home Z Axis without issue. When I send a G29 my Printer starts probing the rear left corner and then proceeds to complete the next 4 points in the x axis without issue. It then moves forward in the Y axis and proceeds to complete the next 4 points in the x axis, again without issue. Then it moves to what is the 9th probing position in a total of what should be 16 position and it immediately deploys the probe before and then Immediately retracts it and displays a probing failed message. I've enabled leveling debugging but I can't seem to figure out where things go wrong. I'm currently on the most current bugfix1.1 Marlin, I was on a version from a month ago and the same issue was happens on that version. Bad wire in the chain maybe? I wonder if there is a conflict related to any offsets? I'm sorry I didn't look through your attached config, but perhaps the offsets for your probe and/or mesh for leveling are in conflict... like the nozzle would be in the corner, but since the probe is offset from the nozzle, then it might shift the nozzle out of the bed area when probing. Just a thought on a Monday morning before coffee, may not be realistic. Try probing a smaller portion of the bed by setting the autoprobe offsets further... maybe? 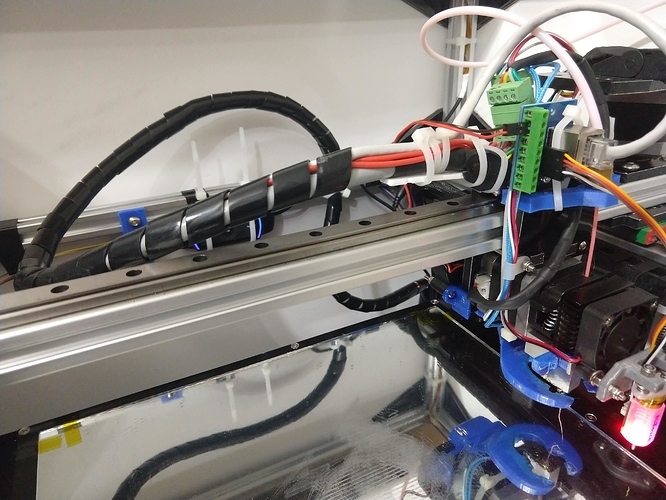 Issue has been isolated to a bad signal connection, this was discovered by disabling motors and manually moving why axes while bombarding the printer with M119 G-Code and found a position where it would go from open to triggered, if I bent the cable and tried again I could get it to return to a open state. So then I ran a continuity test and on the first cable I tested (the white signal wire from BLTOUCH) I found the offending wire. I then made a quick patch harness out of some spare wire and bypassed the original wiring and attempted G29 and it completed without issue. I then opened up my cable chain and found where the issue was and completed a temp fix while my replacement extension cable comes from S.Korea. buttoned it all back up an guess what? ?.......it works now. I've had continued issues with the X-rail cable chain, where I'd break a BL-touch wire or a motor wire every month or two... needless to say, that cable chain is no longer there. If you don't mind me asking what did you replace the cable chain with? I'm back at it again with a broken wire, this time its to my x axis ends top.